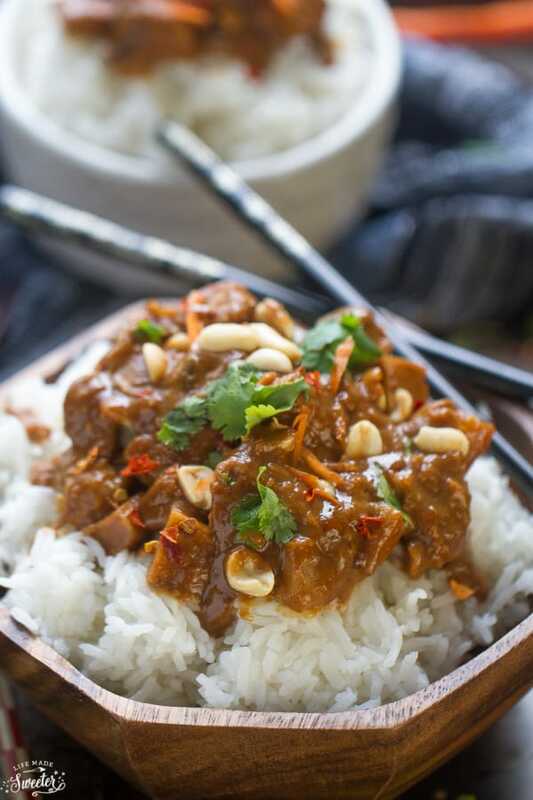 Slow cooker Thai Peanut Chicken makes an easy Thai -inspired dish perfect for busy weeknights. Best of all, just set and forget with a sweet, salty, savory, spicy sauce that is exploding with flavor. If I had to choose our perfect meal, it would have to be anything Thai. Their signature flavors made up of sweet, sour, spicy and savory are completely irresistible. 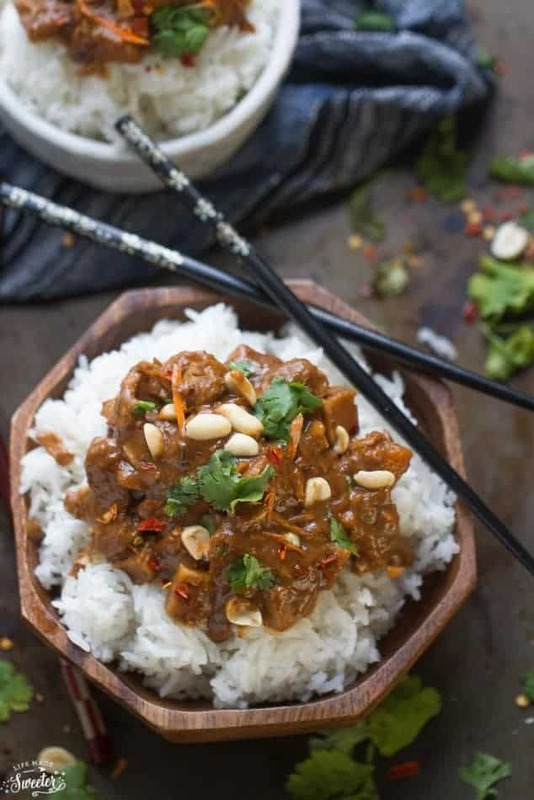 This Slow Cooker Thai Peanut Chicken is one of our favorite dishes we like to keep on rotation during the week. The flavors totally rock and best of all, it’s super easy to whip. Just set and forget in the crock-pot – SO perfect for busy weeknights! Fork tender chicken from cooking low and slow in the crock-pot. Infused in a sea of a savory peanut sauce made with coconut milk, soy sauce, red pepper chili flakes, lime juice, garlic, ginger and honey. Top it off with some fresh cilantro, chopped peanuts, and for an extra (optional) kick of heat, a sprinkle of red pepper chili flakes. The sauce on this dish is everything and you may even want to drink it up by the spoonful. You can serve this over rice, noodles, or over a bed of lettuce. The best part is, you can set-it and forget-it in the slow cooker which makes this a KEEPER! For easier weekly meal prep – The sauce can be prepped ahead of time the day before and stored in an airtight container in the fridge. For an extra kick of heat, try using a couple teaspoons of sriracha sauce or some crushed red pepper flakes to spice things up. Makes great leftovers – make a batch on Sunday during meal prep and pack for your weekly work or school lunch with a side of vegetables, quinoa or rice. 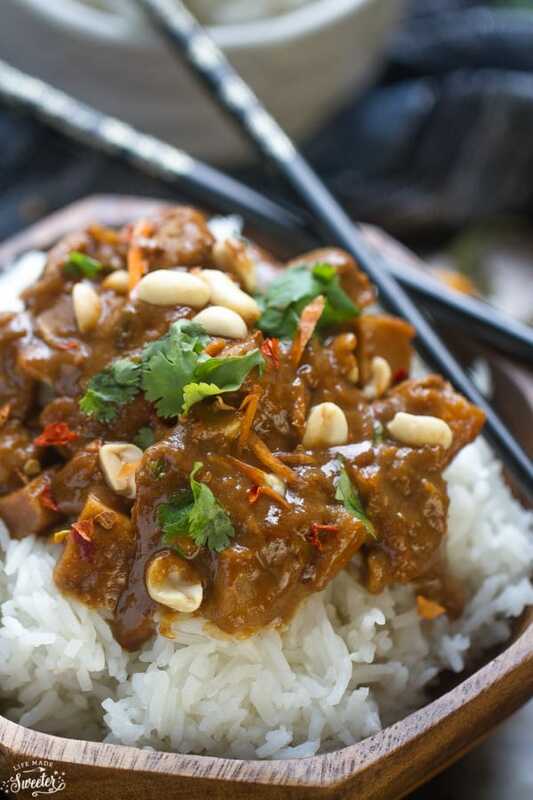 Easy slow cooker Thai Peanut Chicken is infused with a sweet, salty, savory, spicy sauce that is exploding with flavor. 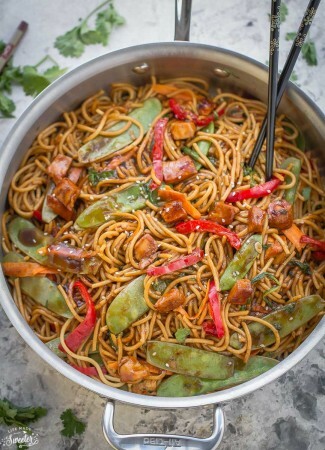 You are going to fall in love with this Asian inspired dish. It's perfect for busy weeknights. Arrange chicken breasts in a single layer on the bottom of the slow cooker. In a medium bowl, whisk together peanut butter, coconut milk, honey, soy sauce, vinegar, lime juice, garlic, ginger and red pepper flakes until combined. Pour sauce over chicken. Cover with lid and cook on high for 2 to 3 hours or on low for 3 to 4 hours (or until chicken is tender - time varies depending on your slow cooker). Remove chicken from slow cooker and cut into cubes or shred. 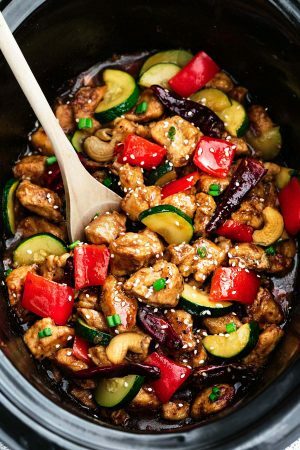 Return chicken to slow cooker and mix in with sauce. Serve hot with additional sauce over rice, rice noodles or a bed of lettuce. Garnish with chopped peanuts, fresh cilantro, and additional red pepper flakes, if desired. 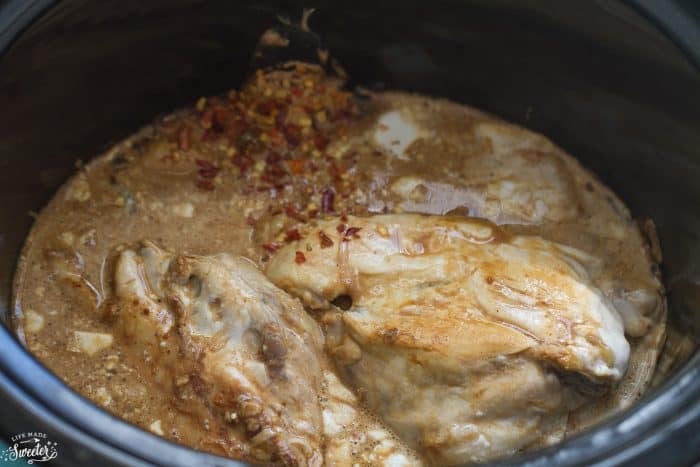 Different slow cookers cook at different levels so please be careful to watch chicken and adjust cooking times according to your slow cooker.